Yesterday, while at the boys trampoline class, I met a new homeschooling mom. She just started homeschooling her son one month ago and I started thinking about, and talking about, the reasons I first started homeschooling and realized how much I've grown and changed in the past 10 month since we started on this journey. These past 10 months have really shown me that learning doesn't have to be linear and learning doesn't have to look like it does in the schools. I've come to realize that the world isn't going to come to an end just because Ian doesn't know all of his multiplication facts yet. He'll learn them when he's ready and sees a need to learn them. I've realized that public school expectations are so arbitrary. I've come to the realization that if they end up having to go back into the school system and they're behind so be it. They're smart, they'll work hard and they'll catch up, I'm sure. Education, while still important has taken a backseat as my main motivation for homeschooling. Don't get me wrong; it's very important and we're learning together everyday, but homeschooling has allowed our family to grow in so many other unexpected ways too that I can't even imagine turning back now. 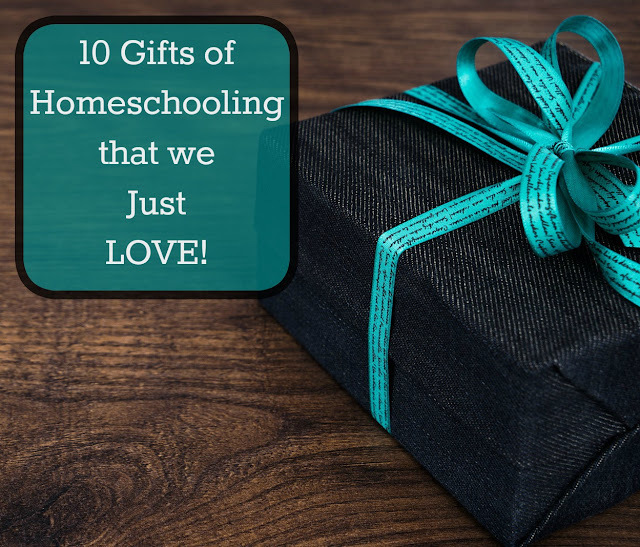 Turning to homeschooling has given myself and my family some truly wonderful gifts I hadn't thought about before jumping into this new adventure together. 1. We have the gift of TIME! We have the time to enjoy one another and life. We have the time to learn about the world around us by going out into the world around us. We have time enough that they can choose to spend hours, days, or even weeks learning about topics that interest them. We don't have to conform to any one's schedule but our own. And it's amazing how freeing that feels; for all of us. 2. We have the gift of FREEDOM. The boys are free from standing in line, asking permission to go to the bathroom, get a drink, eat, etc. They are free to learn about what interests them. We can skip school (for many days on end if we feel the need) without fearing truancy or reprisals from the school community. We are free to teach wherever we are and whatever time it is. I can wake the boys up in the middle of the night to watch the meteor shower or see a rare blood moon. We can take off for a vacation and learn while we're in a different state-- or not. We get to choose and homeschooling has given us the freedom to be in control of our family. 3. We have the gift of TOGETHERNESS. OK, I'll admit, sometimes this feels more like a curse, but I know it's really a gift. We are creating lasting family memories everyday. When my kids think of childhood they aren't going to think of a building with strangers and friends, desks and chairs, rules and regulations; they're going to think of forts in the living room, picnics in the yard, trips to zoos and aquariums. Other families' occasional fun has turned into our everyday fun. 4. We have the gift of LIFE. No, I don't mean we've experienced another birth in our family and yes I agree that just by being alive we all have experienced that gift. But I hope that whether my kids turn out to have higher test scores or not they will be well equipped on how to manage stress, they will know what is really important in life, how to enjoy what little time we have on this Earth, and how to live life to the fullest. In our society we equate success with good grades, having a job where you make lots of money and living in a big house. My kids have picked up on all of that already and honestly, I'm trying to deprogram them. I, obviously, want them to have good jobs and be able to support themselves and their families financially and emotionally, but I also want them to be happy. We only get to live this life once. Why be miserable making lots of money if you can be happy making a little less money and having fun with your family too? 5. We have the gift of HAPPINESS. Speaking of being happy, homeschooling has allowed me to see my kids happy, thriving and smiling. They're sometimes silly, they're sometimes crawling over each other in fits of laughter, they're sometimes just smiling and I get to see it all. I can't argue they're always happy but overall we're happier now than we've ever been, individually and as a family. We've slowed our lifestyle down to allow ourselves to find the joy in the everyday, find the wonder in stopping and observing nature, find the hope in the endless cycle of seasons and rebirth. 6. We have the gift of CONFIDENCE. I have watched my kids grow by leaps and bounds this past year. I may not always have as firm a grasp as I'd like on how much they're growing intellectually but I can, most definitely, see how much more confident they've become. Evan's shyness has almost vanished completely. They aren't afraid to speak up and ask questions when we're out and about. They approach kids on the playground or out in public and readily make friends. They have much less fear of being picked on for wearing the wrong clothes or saying the wrong answer in class and getting laughed at. They don't have to worry nearly as much about what other people are thinking or saying about them behind their backs. The boys have a wonderfully large group of family and diverse friends that accept them for who they are and all that combined with our love and support of one another has helped them develop a wonderfully healthy level of confidence. 7. We have the gift of HEALTH. This past year of homeschooling has been amazing as far as health. Between the three boys we almost always had someone sick in this house from October until April. But this we didn't! I think this is partly due to the fact that they are no longer in one classroom sharing everything, including germs, with the same 20- 30 kids day in and day out. Mainly, I think it's due to all the fresh air, exercise and reduction in stress. They run, climb, jump and play in the sun, in the fresh air, and they're glowing, growing and thriving. 8. We have the gift of CHILDHOOD. Being with my kids day in and day out, watching, listening and teaching them I've learned to remember what it was like to be a kid. Childhood is short and I think as a society we're making it shorter. Kids are in school for longer days, more days out of the year and are required to do homework after school much earlier than ever before. We're robbing our kids of the happiest times of their lives and I'm glad homeschooling has allowed us to recapture our children's youth. My kids ask me to participate with them and I have to admit I have often felt like a child myself alongside them when I give in to their pleas to jump on the trampoline or swing on the swings; things I haven't done since I was a kid. They've helped me find my inner child while I'm supporting theirs. It's a wonderful feeling. 9. The gift of SELF DISCOVERY. It's not just the kids who have learned a lot about what they do and don't like this year! The boys have a lot more free time now and often are complaining of being bored. This boredom has led them to new discoveries about themselves. They're in charge of keeping themselves entertained most of the day and I love how much they're learning about themselves and each other. In stepping back from all the demands on family life I too have learned a lot about myself both as a mom and as a person. I've learned to adapt and go with the flow and find that most times I actually prefer that. I've stopped saying "no" so much and find that saying "yes" leads to discovery, fun and memories most of the time. I've learned that I'm not nearly as traditional as I thought I was. I've always been a rule follower and have instituted many rules in this house. Being home with the boys more has allowed me to relax with all these rules and I'm loving it. "Sure let's throw a birthday party for your stuffed animals complete with pinata!" 10. The gift of being UNDEFINED. OK, so I'm not even sure that's a word but I couldn't think of anything else to describe what I meant. My kids aren't identified as a pre-schooler, 1st grader, and 3rd grader; they all do work from a wide range of age groups and levels. Some days we count, some days we add, some days we multiply. They aren't defined/ labeled as smart, gifted, struggling, etc. They aren't told they can't learn cursive yet because they aren't old enough (or that they should already know something because they are ___ years old). They've learned to stretch the boundaries and assert their knowledge when necessary. They are taken on their own merits for their own behavior and aren't held up to a standard of their peers. They don't have to worry about following in one another's footsteps through school trying to meet the teacher's expectations based on a sibling's performance. They are free to be themselves and know the joy in being an individual. Today we're combining all these gifts with an early trip to the bowling alley. We definitely did a lot of learning; after every turn and every frame the boys compared scores to see who was in the lead, how far in the lead that person was, how many pins they needed to catch up or get ahead. It was great. Even Evan was able to tell me who had the most points and who had the least. We laughed, we played, we learned. Yes! Absolutely! And the best gift of all of all of those gifts is, they will each be a blessing to your family in some way, to some degree for all of your days. Enjoy! There's the gift of teaching them how they learn not how others think they should learn. This is what see as one of the amazing strengths of homeschooling whether people move to unschooling or more traditional routes is that you can pick a learning style that works for the child, not trying to make the child fit the program. That was one of my biggest frustrations in teaching was knowing another way was better and being told it wasn't the approved way. Oh yes! That is a good one. I love that my boys can learn HOW they want/ need to too. Thanks for this! Time has been the greatest gift that has kept me in the homeschooling saddle for all these years of high school. I've probably said it here before, but there's no way our kids could have taken vocational classes and also prepared for college and been involved in the music and drama opportunities they've had if they had been chained to a desk in public school. Yeah, when we looked into possibly sending my oldest to high school I just kept thinking of how much he'd have to give up just sitting at a desk all day. Absolutely precious! Thank you for sharing these glimpses into your life and the rhythm of your days! What a gift you are giving to your children! So much YES!!! This is so wonderful, and as I read I am thankful that I too have all of these wonderful things. That I too, have learned so much on this journey that we call homeschooling! It is a beautiful and blessed thing! You're welcome! I often take it for granted but we are so fortunate to get to live this life. So many wonderful gifts! I am so glad I have the privilege to homeschool my kids as well. It's pretty great! First nice day we've all had year and we get to spend it at the beach.